April has been sunshine and snow. It is funny to have a day when the temperature is 70 degrees and the next day it is snowing. My daffodils got snowed on several times this year. I have been working on some placemats with a variation of honeysuckle overshot. She picked out the design when I showed her some of my work. I was surprised to see that I wove that pattern in 1988. I really like the look of it and I am surprised that I have not done any other work with it. I often thought I would like to do some yardage with a fine thread using that design. It has a lacy look and I am very pleased with it. I also did some weaving for a woman who does baby wraps. I have always wondered about weaving them. It is a lot like weaving yardage, just the same thing over and over. In this case the 8/2 was about 24 ppi and it took a while to weave a yard. 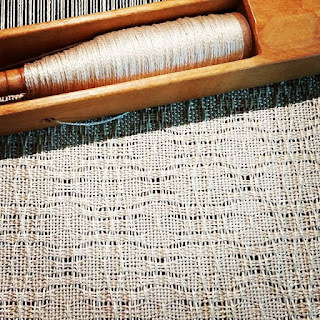 I was slower than I usually think about my weaving. 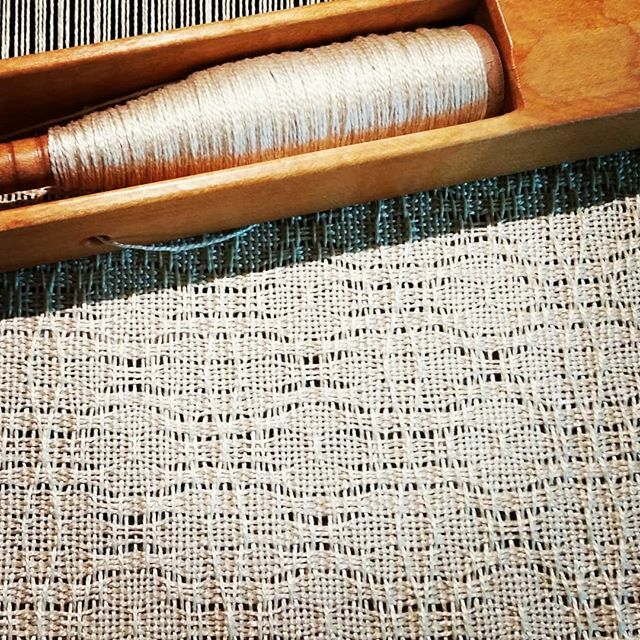 It was pretty familiar to weave, because it was on a Macomber loom. It was about 8 inches wider than mine, so it felt heavier, but I love to weave on a Mac. I also took a class in tonder lace with the bobbin lace group. I have always loved the look of point ground laces and I was interested in tonder. I was a bit over my head. I had not done lace for a few months and it took a couple of hours for me to get into the groove. Tonder is done with 140/2 cotton and so after a six hour day, I had about a half an inch. I took it apart a couple of times and I had to adjust to that fine yarn. At first I was breaking it. The second piece that I got to start is a straight edge that this heart is based on. It is really beautiful lace. I am not sure if I like this better than Bucks point. I am also working on getting my old stacks of stuff cleaned up and some of it given away. I really think it is time that I pass around some of my "stash". There are some projects that I will never get around to.